This Commercial Bicycle Outfit is very rare. 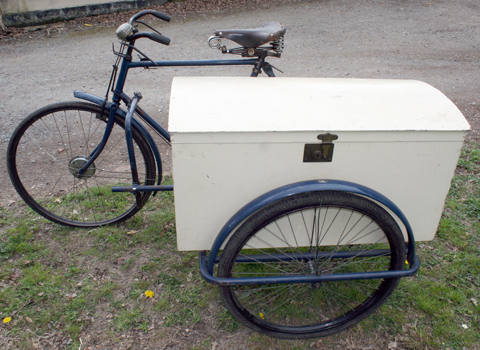 You don’t see many bicycle sidecars at all these days, and the majority comprise a small Watsonian chassis sold as a separate unit that could be used for either a box or a passenger (child’s) ‘launch.’ However, this one has a large box and heavy-duty sidecar fittings. 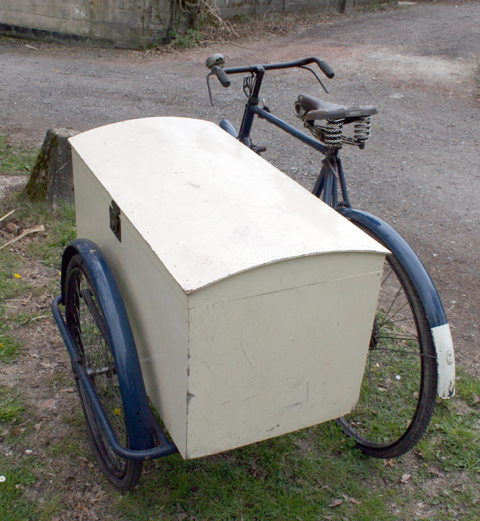 I’m not sure of its age, but it’s in the style of the bicycle outfits from the early years of the 20th century. Though the blue and white colour scheme might be reminiscent of ice cream sales, it would lend itself admirably to advertising any type of profession. Many businesses these days – large as well as small – like to sign-write a vintage vehicle and display it for public relations purposes at local summer shows. Given that vintage vehicles hold their value well, this has become a very affordable form of advertising. 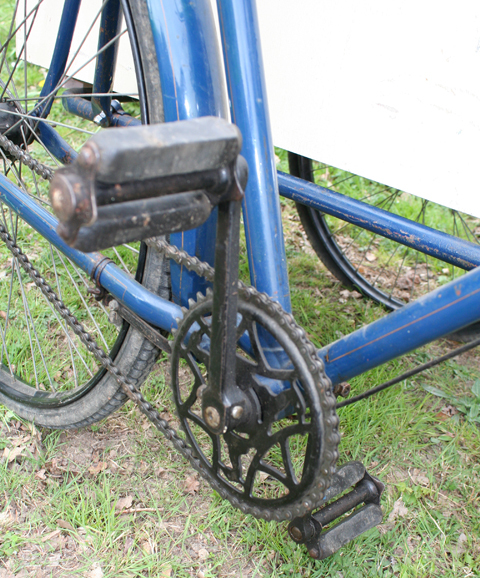 This outfit is in good working order, so it can also be ridden. Though please bear in mind that the art of sidecar-riding is now a lost art – while not difficult, it’s not as easy as riding an ordinary bicycle. You’d do well to practise in private before riding it in public. 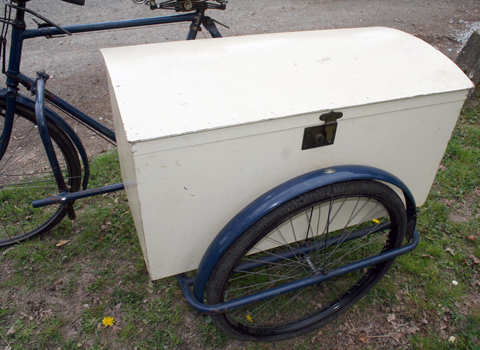 The box is in good condition, opens and closes easily, and has a latch. 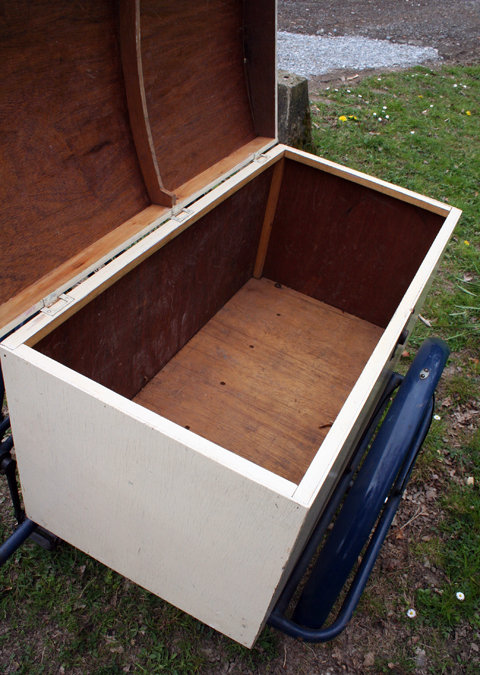 The box is also clean and tidy inside. 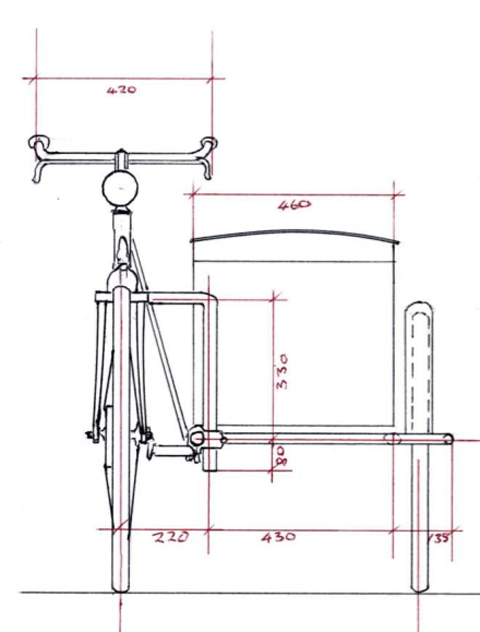 This is a factory-built well-designed outfit, with strong sidecar supports that attach to the bicycle in three locations. It can easily be detached by one person in just a few minutes. Fitting #1. 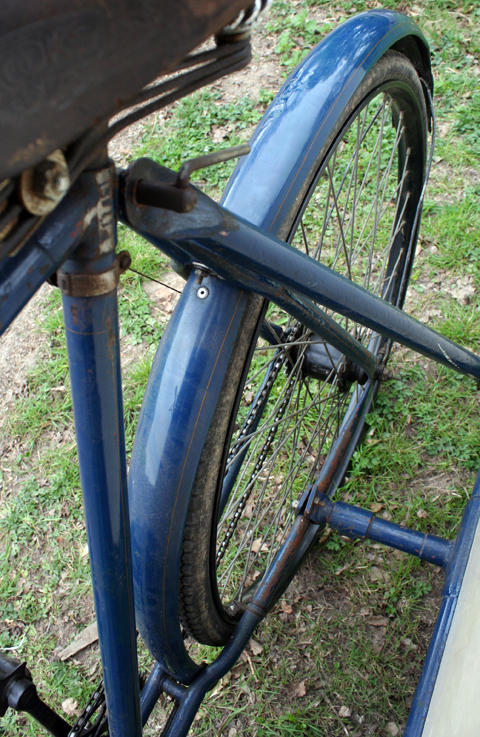 Observe the fitting above the front forks (seen above, or in close-up below) whose nut can be turned easily with a spanner to adjust the angle of the sidecar. 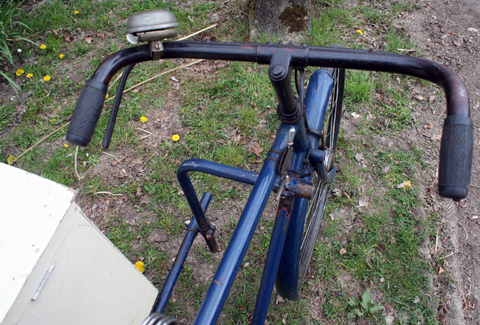 Fitting #2 (below): the fitting behind the saddle is detached (or, alternatively, tightened) with a small lever which remains on the bicycle. Fitting #3. 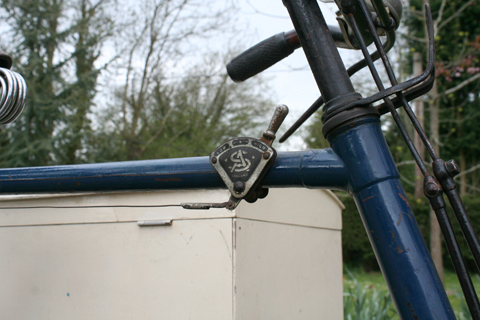 The third fitting is simply a clamp to the bottom stay. 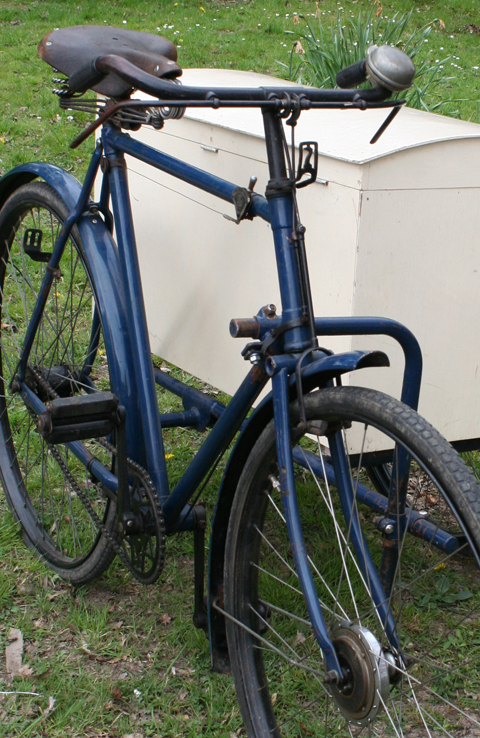 Three-wheelers were popular in Europe, but less so in Great Britain. One reason was that, from the earliest days of motorcycling, British motorcycle manufacturers recognized the commercial potential of motorcycles and offered a wide range of sidecars. 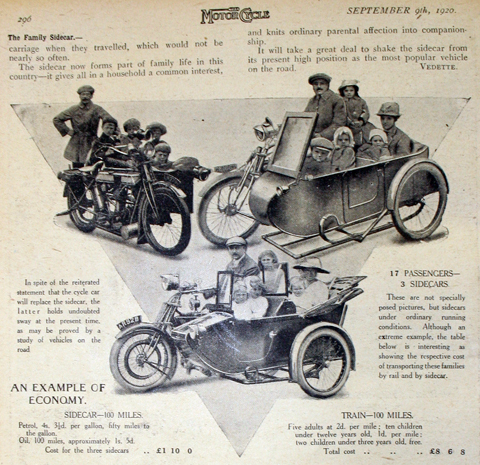 As you can see in the 1920 article pictured above entitled The Family Sidecar, a motorcycle combination could transport as many passengers as a small saloon car. Motorcycle outfits were well-suited to commercial use, and were much faster than any of the three-wheelers on offer. 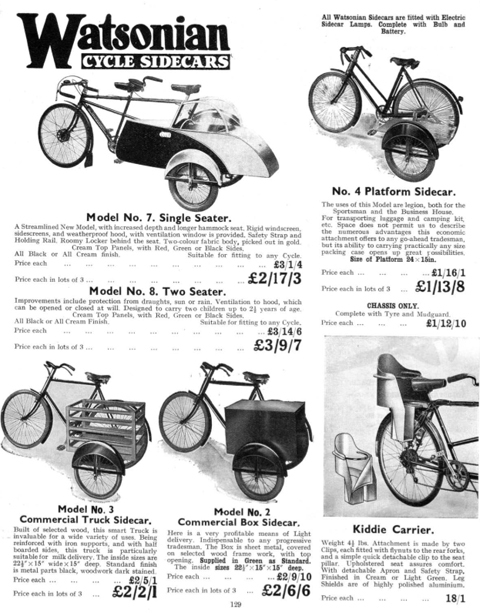 Most three-wheeler commercials were made in small numbers by minor manufacturers, while sidecar outfits were made by top motorcycle manufacturers and coach-building companies who obviously invested a lot of money in their development and after-sales service. 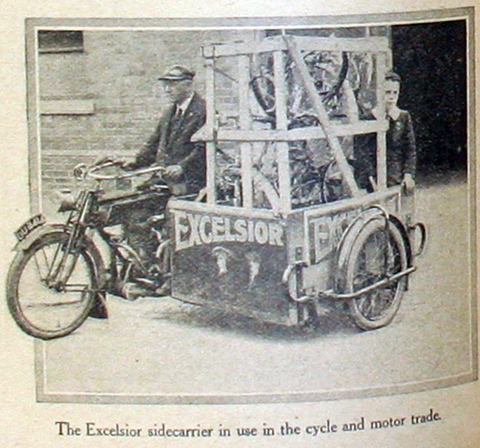 The Excelsior ‘sidecarrier’ illustrated below appears to be transporting bicycle parts. 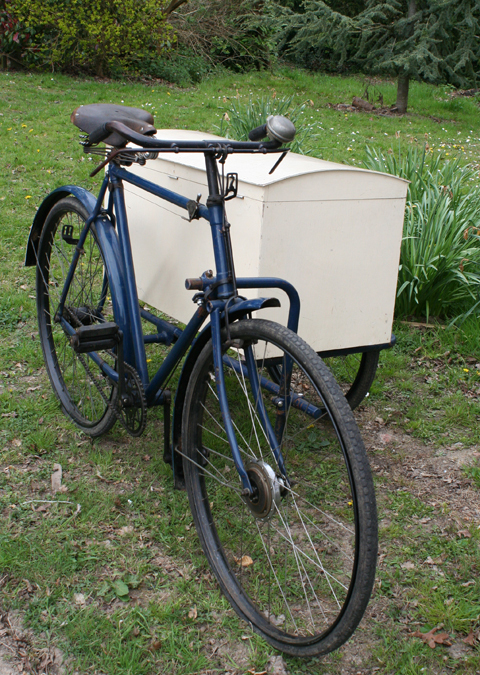 Bicycle sidecars were a different kettle of fish. 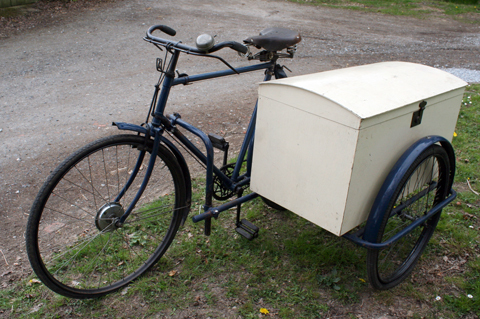 A tricycle could definitely hold more goods; however, unless those goods were reasonably lightweight they would not be easy for one person to manage. 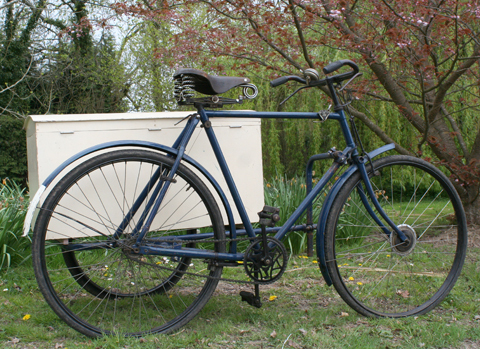 As there would have been an optimum weight for a tricyclist to carry, a bicycle with sidecar would also be suitable in certain cases. 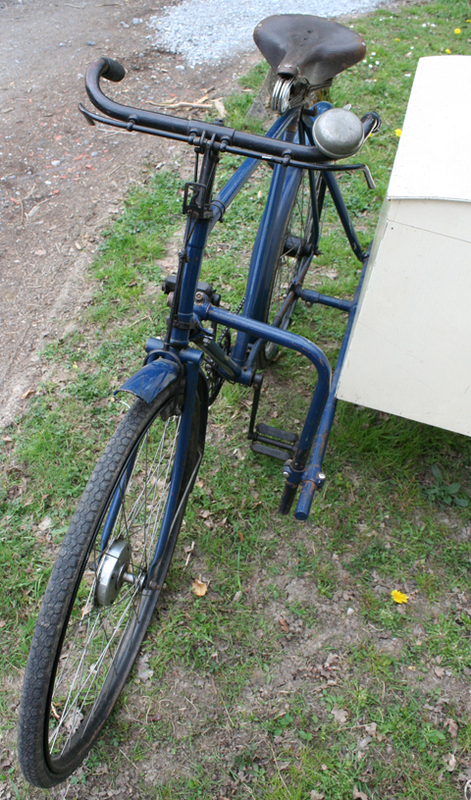 But the main advantages of a sidecar outfit are the same for both motorcycle and bicycle. 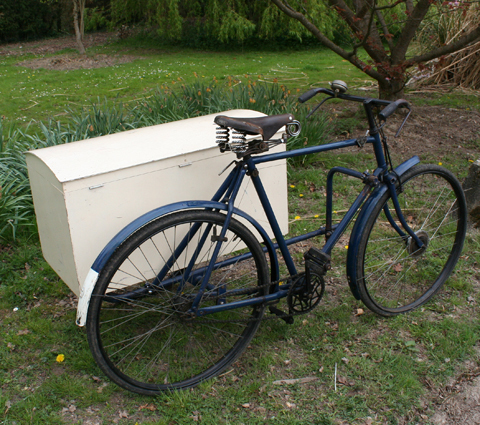 A sidecar can be detached easily, so a motorcycle or bicycle outfit is very much easier to store than a trike. 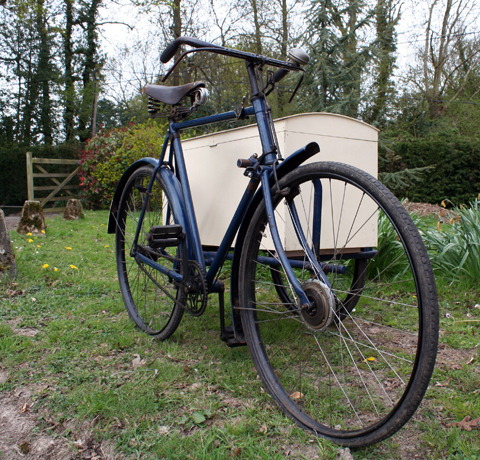 And an even bigger advantage is that the cycle can also be used solo when not needed for professional carriage. 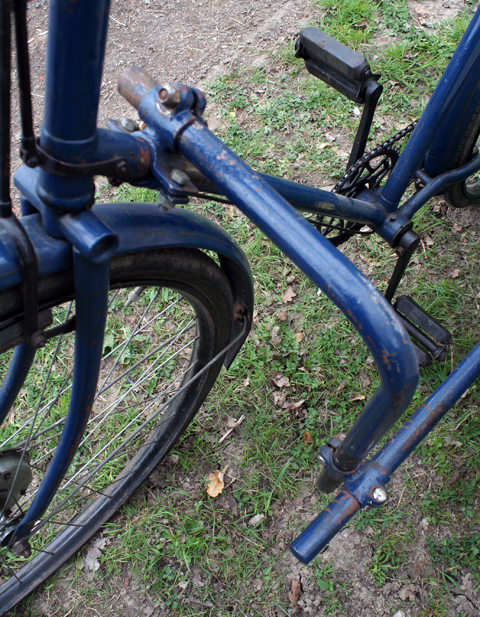 The blue paintwork is not its original colour – of course, they were usually black. But it looks like it has been on there for many years, and I assume it was painted for a particular professional purpose. 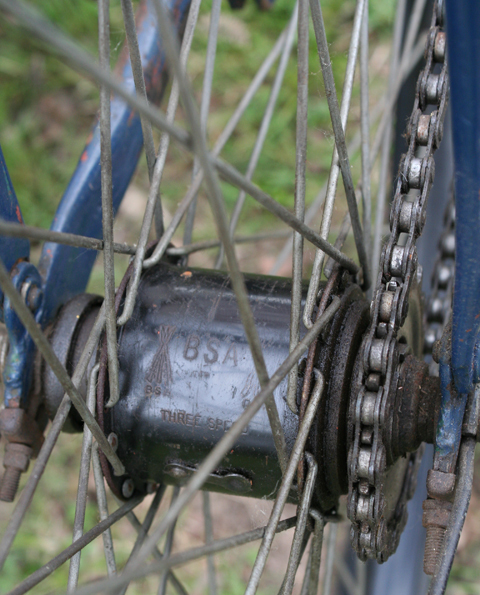 The rear hub is a BSA three-speed (much rarer than its Sturmey Archer counterpart). 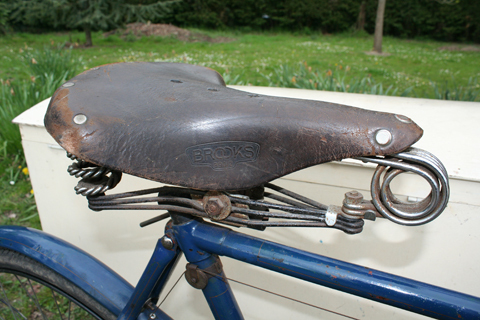 A heavy duty Brooks commercial saddle sets it off well. So there you have it: a commercial outfit that you can use or display, with an impressive sidecar that’s easy to remove and store …and, if you buy it as a business, you might even get tax relief on its purchase.